The history of astronomy is in many ways a history of building ever more powerful telescopes. Since Galileo first pointed a telescope at the night sky, we’ve strived to peer deeper into the night. Of course one of the downsides of ever more powerful telescopes is that with higher magnification generally comes a smaller field of view. Technically, a field of view is measured in an angular area known as steradians, but since a telescopes field of view is generally circular, it’s often simply measured in terms of the width of the circular field. For example, a modern 8-meter telescope has a width of about 0.2 degrees, or a bit less than half the apparent width of the Moon. By comparison, the faint-object camera on the Hubble space telescope has a field width of about 0.001 degrees. 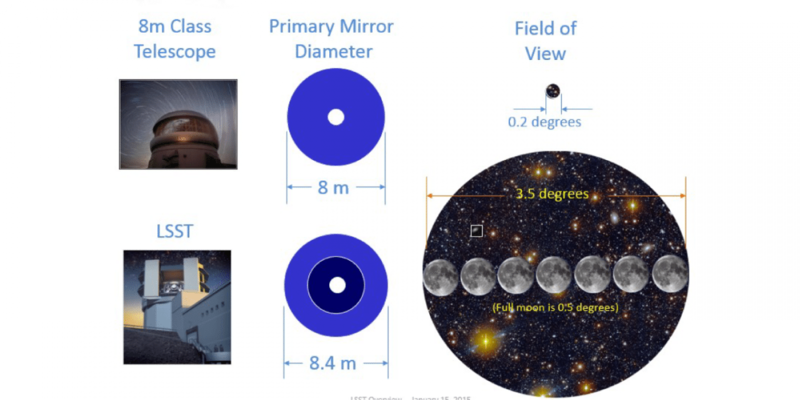 Modern telescopes aren’t nearly as bad as Galileo’s telescopes, which had a magnification of only 10 and a field of view only a quarter the width of the Moon, but it is still an issue for many telescopes. At high magnification, it is often like looking at the night sky through a narrow straw. This isn’t a problem if you want to look at faint objects with a small apparent size, but it is terrible for doing large sky surveys. For that you’d like to have both high magnification and a wide field of view. Fortunately with computer designed lenses and modern manufacturing techniques we are starting to achieve that goal. Perhaps the clearest example is the Large Synoptic Survey Telescope (LSST) currently under construction. It’s 8-meter design will have a field width of about 7 Moons. It does this through a complex three mirror system. Since the primary mirror is more ring-shaped than disk-shaped, it loses some of the light gathering power than more traditional 8-meter telescopes have, but the wide field more than makes up for it. 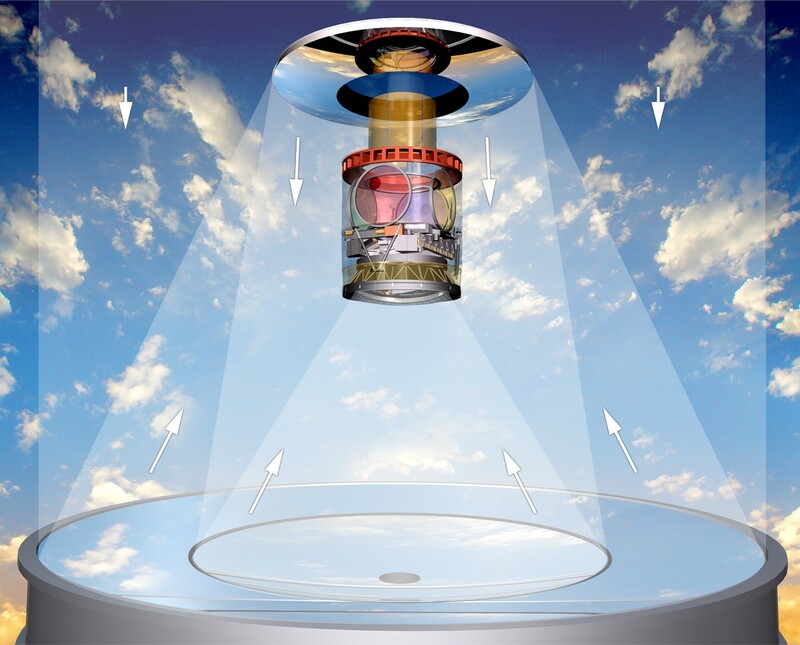 The goal of telescopes like LSST is to scan the sky in a matter of days. In this way we can observe how the sky changes on a scale of months and weeks, and we’ll have a better chance of observing transient objects such as supernovae in their early stages. This wouldn’t be possible without a wide field of view. Doesn’t the field of view depend on the eyepiece? The shorter the focal length of the eyepiece (magnification), the smaller the field of view.